During his recent travels, Thoresen explored new media, such as resins, highly saturated colors, thick and varied textures/materials, and quick gestural impressions to create a fresh body of work. The commentary pieces spring from a series Thoresen did when there was unusual turmoil in the country from the assassination of Martin Luther King and Robert Kennedy and the resulting riots, and the protests associated with the Vietnam War. “There may not be as much violence as 1968, but there are bitter divisions in the current political climate and serious questions about the political leadership and the direction of the country,” he explained. Thoresen was also part of a team that created the Artist Advancement Grant for the New Hampshire Charitable Foundation and for many years served as a juror for the selection of the recipient for that award. Thoresen served on the Board of Directors of the NHAA and as its President from 2005 to 2009. 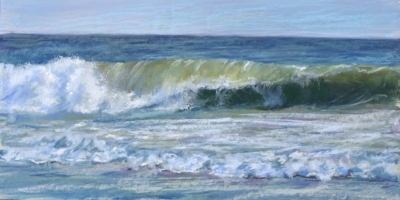 PORTSMOUTH – Six artists from the New Hampshire Watercolorists group will have their work on display at the Robert Lincoln Levy Gallery during the month of September. The body of work is titled, “New Hampshire Essence,” and it depicts images from around the state of the waterfront, wildlife and landscapes. Exhibiting watercolorists are Roseann Meserve, Gwen Morgan, Lyudmyla Hoffman, Eunice Miller, Carol Poitras and Cate Poole. When: Sept. 5 - Sept. 30. Opening reception, Friday, Sept. 7, from 5 to 8 p.m.
Press Release for the East Gallery in July 2018. Press Release for the Gerry Frazier Gallery in June 2018.